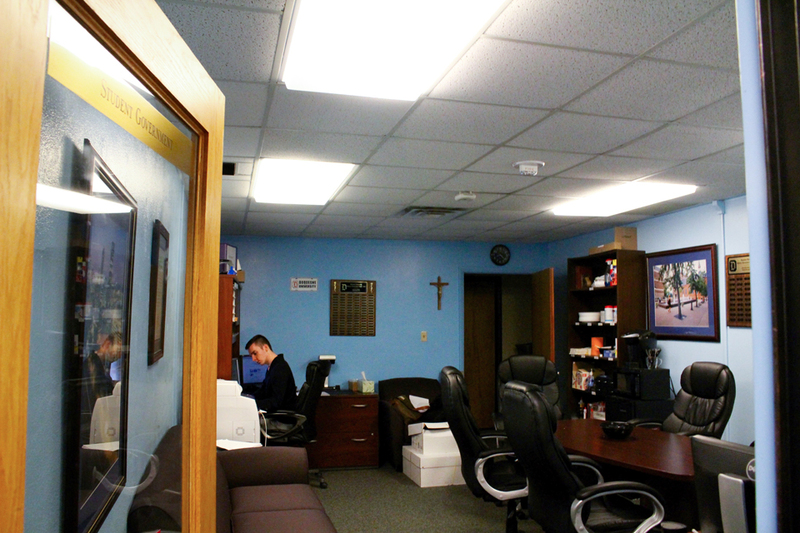 SGA Senator Michael Rand works in the organization’s office in the student union Wednesday. The SGA is suffering from low participation rates. The Duquesne Student Government Association is working to improve its record-low participation rate, with only 8 of its 47 Senate seats currently filled. According to SGA member Michael Rand, eight SGA senators ran for election uncontested to fill the 2016-2017 Senate, down from 11 senators at this time last year. Rand said the participation rate is low despite the fact that the SGA sent out multiple emails to encourage students to run for office and lowered the requirements to get on the ballot. “I think the low participation reflects poorly on the student body, not the election process,” Rand said. SGA member Austin Gagliardi compared the low SGA participation rate to low attendance at Duquesne basketball games. “In general, I don’t think students on campus really get involved very much,” Gagliardi said. According to Gagliardi, students can avoid the election process and become a senator by attending two SGA meetings and completing four “office hours” in the SGA office in the Student Union. Former SGA senator Tyler Siminski had a different view on the low participation rates. “It needs to be easier for students to get on the ballot,” Siminski said. According to Siminski, who left the SGA because his schedule became too busy, he sponsored several bills to reduce the requirements for potential senate candidates to run for office. Currently, students need to get a percentage of the student in their academic school to sign a petition on their behalf. The required number of signatures ranges from around 20 in the music school to more than 100 in the Liberal Arts college. “It is easier to go through the phase-in process,” Rand said. He added that he expects there to be up to 30 senators in the SGA by the end of the spring semester. However, this means more than two-thirds of the eventual SGA senate will not be elected by the student body. Rand said the SGA has considered making the phase-in process more difficult, but this has potential drawbacks. “If you make the phase-in process more difficult, the upside is that the senate races will be more competitive. The downside is that you create barriers to entry for people who might want to join SGA,” Rand explained. Siminski said the SGA needs to focus next year on making sure the election process is not too hard while the phase-in process is not too easy. “It really needs to converge somewhere in the middle,” he said. One Response to "Only eight SGA senators represent 10,000 Duquesne students"
Or the school could shut down SGA because it doesn’t do anything for the students besides create theatrical drama for the very few people that care. Hmmm…then you would have the participation rate from the number of students you deserve. Just emails? That’s weak broadcasting, sounds fishy to me.